Please note that if you play in our youth leagues, all players must have full face protection at all times. This includes if you are 18 years of age and play 17 & Under House. Print this Checklist before you go shopping! 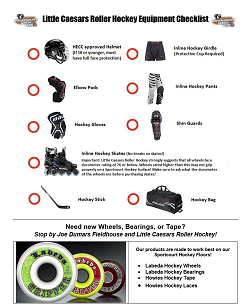 If you are looking to try out any of our programs to include Learn to Play, Skills & Drills, or the Mini Mite program and need some equipment to borrow, please contact us by calling 586-731-3080 during normal business hours, or email Matt Koleski at MattK@lcrh.info.